I’m beyond thrilled to have had the opportunity to interview the esteemed art teacher, Don Masse. Don works at a visual arts magnet school in San Diego, and is a hugely influential figure in the field. He maintains an exciting blog, Shine Brite Zamorano, is active on Twitter: @shinebrite71 and Instagram: @shinebritezamorano, and frequently writes for Arts & Activities Magazine. Don, when one looks at the projects you teach, it becomes immediately clear that you do things differently. You have a very singular approach: one that puts a high premium on introducing students to contemporary artists. Additionally, these artists are often local San Diego artists, which, it seems to me, lets students make more meaningful connections between their art, their sense of place, and their identity. Could you elaborate on why you place such an emphasis on contemporary art? Has this always been at the forefront of your practice? Engagement. Pure and simple. I strongly believe that students are much more engaged in content when it is relevant to them. One of the first questions I get when introducing focus artists are “Are they still alive?” There’s a certain level of excitement with that question and I want to keep that energy going throughout the lesson and the visual experimenting that my students do in class. I strive to introduce them to artists working now, from a variety of backgrounds and careers, so that my students can see how these concepts are being applied in the current, real world by people like themselves. This was not always my approach. When I first started teaching as an artist in residence at Zamorano back in 2001 (the only school I’ve ever taught at) I was much more inclined to build my curriculum around the usual dead white guys. It wasn’t until a few years in that I started to shift my focus gradually to the work of contemporary artists. What really started opening things up for me was tapping into the breadth of the internet. I started exploring visual themes online and discovered the blog “dear ada”. This blogger shared the work of different contemporary artists every day with her audience. I started to incorporate some of these artists into my curriculum and I noticed an uptick in the energy level in class. My students were more engaged… and so was I! What are your views regarding art history? Do you think it is important for students to learn about artists from the past? I do think it’s important for students to learn from the past, but I think it’s imperative that we link the past to what’s going on now to better engage our students. When my students are exploring abstraction with contemporary artists, I do touch on the fact that these methods have been explored by a variety of artists in the past. I often liken it to how musicians have built on the vocabularies of the past and how current bands sample other pieces of music, appropriating elements, and creating something unique with those different pieces of new and old. Your projects seem to always be centered around a specific artist (rather than a group or technique). It is common to see projects inspired by an artist’s style that are overly procedural. As a result, a particular class’s work can all look too similar and somewhat stale. It is imitation in a superficial way. Your projects, on the other hand, seem to give students a lot of choice during the process. Consequently, the work looks exciting, unique, and expressive, while also possessing the aesthetic spirit of the master artist’s work. This shows respect for both the artist being taught as well as the student’s own capacity to make meaningful, creative decisions. Could you briefly explain, in terms of lesson planning, how you maintain that balance between learning about an artist and giving ample opportunities for creative choice? Ah! This is one of the aspects of teaching in which I think I have grown the most in over the years. In the beginning, I approached lessons with very little room for student choice. We were following a formula to create a work of art. Students were gaining time to practice formal elements of art but I wasn’t allowing them enough opportunities to genuinely express themselves and to develop creative and critical thinking skills. The shift happened gradually, along with my shift to more contemporary art in my program. After I started attending NAEA conferences, I opened up the levels of choice and student decision making even more. Within my curriculum now, I do strive to balance 2 sides- design constraints and creative choices. I don’t want my students producing 30 identical pieces, and I still want them to exhibit understanding of lesson skills and concepts, so they can build on those in the future. I use my focus artists to serve as inspiration for my students visual experiments, not as recipes to follow exactly. In terms of lesson planning, when introducing an artist, I will share several pieces, so students can see how artists repeatedly explore a similar theme/concept while also pointing out the variety in the visual results. During the lesson intro, I’ll also connect the work to state/ national standards and emphasize key vocabulary and concepts. The next step is to provide students time to experiment and play with the elements and within the set constraints for the activity. Usually, it’s creating multiple sketches, thinking about which one they would like to proceed with, and sharing that info with a neighbor. Then we dive into idea revision and creation of their final visual product. The path from artist to student outcome… once I find the artist, the process is pretty straightforward. Planning the lesson from the back end and connecting the processes to state and national standards. Getting to the artist is often a roundabout journey for me- taking deep dives into social media platforms like Instagram, doing searches for artists of particular backgrounds and careers, and general noodling online. Honestly, I’m a collector, not quite a hoarder- this pertains to ideas/ influences, as well as the general state of my classroom and house. I gather and gather, and then sit down and and make more concrete connections to instruction. I keep my curriculum loose and broad, so that throughout the year I can incorporate artists who will resonate with my students in authentic ways. You also seem to expose students to styles and modes of art that haven’t conventionally fit into the realm of fine arts, such as street art, quilting, and illustration. Why do you think it is important for students to learn about these other, often underrepresented, approaches to art making? Again, it’s about engagement. It’s about honoring these art forms and recognizing that they are just as valid as the “traditional” high arts. Often times, these forms like quilting and street art have been devalued because of who are the main creators of them- women and groups other than guys of European descent. I want my students to understand that visual art is everywhere and it can be made by anybody. It doesn’t have to be behind closed doors in a gallery or a museum. These other forms of visual expression enhance our everyday experiences- they lift us up, they tell stories, they are visually complex and engaging. I emphasize these forms, because in the political climate that we live in, my diverse student body deserves to see the work that is being created by people like them. This year I taught a cityscape lesson to my second graders that was inspired by the work of Stephen Wiltshire. We learned that he has autism, and is able to draw entire cities from memory with incredible detail and accuracy. It was so great to see the students in awe at his abilities. We watched a video of him working, and while he had difficulty communicating verbally, all of my students thought he was a superhero. I felt like it shifted their understanding of what a disability is. You recently taught an incredible lesson inspired by local San Diego artist, Jeremy Sicile-Kira, who also has autism. What was this experience like for you and the students? Did you have any memorable or rewarding moments? I am so glad to hear that your students responded they way they did! I mean, how could they not, really? Again, one of my mantras is anyone can create- you just need to find the avenue that works for you and then play and practice, play and practice. Sharing Jeremy’s work was powerful. It showed my students that despite all sorts of limitations, all people can find their voice through the Arts. I love your project inspired by Skip Hursh where students made really dynamic GIFs through the process of app smashing. It also looks like you are doing exciting things with a 3D printer. What are your views on technology integration? Do you think it is important for art teachers to stay on top of tech trends in education? Man, I loved doing that Skip Hursh project as much as, or more than the kids! Here’s the thing with tech- it’s another tool in your creative toolbox. The kids are exposed to digital culture on an everyday basis. Why not use it to expose them to concepts that we are addressing in our curriculum? Whenever I break out the iPads for a lesson, the kids get super stoked. I rarely have my students work independently with tech and that fosters social as well as visual art learning. Give them opportunities to teach each other in any media and allow them time to grapple with compromise and respect of ideas in the creative process. Professional football player. I had it going on during the daily pickup games on Madison Drive back in the day! When the NFL goes two hand touch, look out! Don’t be afraid to say no. I think back to all the extras I agreed to my first couple years, and the balance of my work and personal life was so out of whack. It wasn’t sustainable and my health paid for it. Also, visit other teachers in their classroom settings- even if you’re the only art teacher on site. I pushed into classrooms for my first 5 years and that experience, while a pain in numerous ways, provided me with so much insight into classroom management and environments, both pro and con. I felt like I grew so much just by observing senior teachers do their thing. Tricia Fuglestad- she rocks the tech with her students in such creative and authentic ways. I’m always blown away by the experiences her students have within her curriculum. Nic Hahn- for her commitment to fostering a sense of community among her circles of life- her students and school and her tribe of art educators. And she works extremely hard to maintain a balance of personal and professional that I have not yet attained. Alice Gentili and Chris Sweeney- for their their 3d printing prowess with students. I know that’s not just 2, but they all inspire me in different awesome ways. Laura and Matt Grundler- for developing and fostering an inclusive, respectful professional learning forum on social media for art educators that continues to inspire and challenge my educational philosophy on a regular basis. I know that you are an accomplished muralist. Do you think it is important for art teachers to make their own art? I do. I really think it’s important for us to continue to experiment and play on our own. Practice what we preach. We need to persevere and push ourselves, just like we ask our students to do. I know it’s hard to commit to personal visual exploration when we give so much throughout the school day, but we need to make time. I go through fits and starts, but whenever I don’t create for stretches, my balance is off. I get moody, I get irritated easily… and this could totally just be me, but I think a lot of creatives feel similarly when we don’t give ourselves time to create. Mural project inspired by Maya Hayuk's work. Maya Hayuk inspired work using the Assembly app. I have loved doing a digital mural project inspired by the work of Maya Hayuk. We have a rich mural program at Zamo and so my students are familiar with public art. They get to create their own murals with the Assembly app on our iPads. The range of student work is wonderful. I’d love to turn some of them into actual murals on campus. Me and printmaking have a long history, so I love to introduce my students to the magic of the medium. In particular, relief printing. Even more in particular, multicolor water soluble marker printing. I don’t think that magic ever gets old for me or my students. I’ve used a wide variety of artists as inspo for this process and the results are always exciting and diverse. 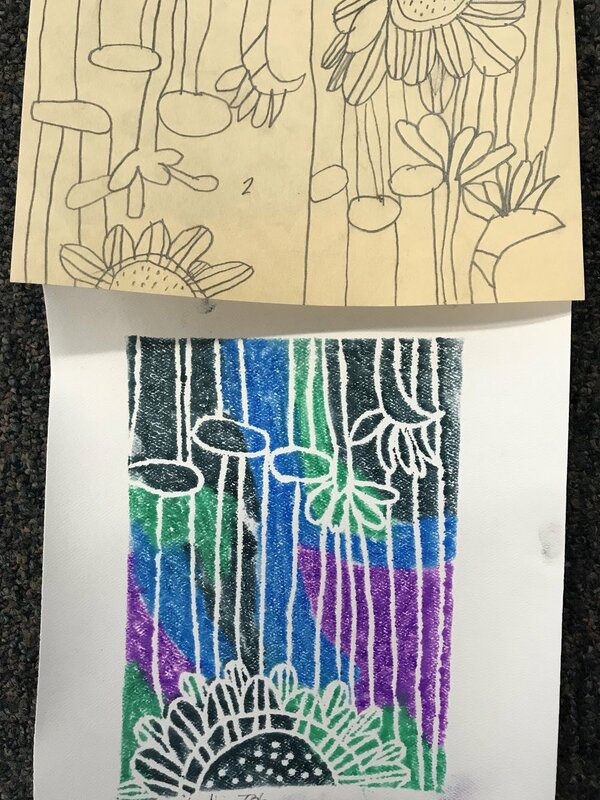 Tom Abbiss Smith inspired work, third grade. Do you think assessment is important in the art room? What does this look like in your class? I do, but I do believe at the elementary level it should be more on a self reflection level. Getting students to think about the creative process through writing, speaking, and listening opportunities. Those are the elements we need to foster and encourage in a non-stigmatizing way. Um, every day. Honestly, I feel so fortunate to work with kids on an everyday basis and contribute in some way to their growth as positive human beings. Keeping our art program intact. Our school relies on the work of a couple artists in residence that are classified employees, in addition to myself and another credentialed art teacher and they do not have the security that we do. Every year is stressful because we rely on community support to raise funds for those positions plus our art supply budget. Our school community- admin, staff, parents- support the art program, but it’s always a hustle to keep things going Year after year at a title 1 school. Our community recognizes the importance of art ed and they give and give and give. I just wish a program like ours was supported district wide, and really, across the country, because the arts make a powerful difference academically and behaviorally with our students. Oh, how do I deal? I do my imperfect best to advocate for our program and the people that make it so rich and wonderful for our students. Promoting what makes our program so impactful to stake holders through social media and student exhibitions. Being a squeaky wheel. More investment in student decision making during the creative process. Despite the devaluing of art ed and education in general from the states across the country, there has been a drive to include more choice for students in the art experiences they are participating in. This fosters creative thinking skills in the decision makers of the future. This will come as no surprise from how I have responded above- Incorporating tech into art curricula at all grade levels, while maintaining a balance between the new and traditional media. Encouraging student decision making at all levels. Let us do our own thing! One of the parts of my job I love the most is tailoring it to the needs and interests of my student population. If we start scripting things, that important element will get lost and engagement will decrease. There should be local control of content, just as there should be local control of ed funding. There can be a loose curriculum set at the district or state level that addresses key elements, but give us the freedom to design the details to best suit our students.